Since the acquisition of Steelbrick, the buzz in the Salesforce.com trailblazer and partner communities is all about CPQ. Talking with clients, many are unsure of the potential benefits of CPQ, or even what it is. Most don’t even realized that they probably have interacted with a CPQ – that same day – and how it affected their experience as a customer. Like I said, you very probably have interacted with one already today, or if not today, very recently. Have you been in a Starbucks? McDonald’s? Dunkin’ Donuts? You interacted with a CPQ today. In fact, most food service Point of Sales are CPQ systems. Let’s take McDonald’s as an example. Maybe this morning you decided to stop in for a breakfast sandwich, coffee, and hash browns. Perhaps you used the new self-service kiosks, or maybe you went to the counter. To start your order, you may have said, “I would like a sausage McMuffin.” The kiosk (or the associate) may have offered you some options, such as making it a meal (bundling) or customizing (adding cheese or egg). You may have ordered additional items or selected a specialty coffee with more options as well. In other words, you configured your order. After getting a price for your order (pricing and quoting), you presumably accepted, and paid, and the order was sent off for assembly/shipping. Doesn’t this sound a bit like what your company does everyday? 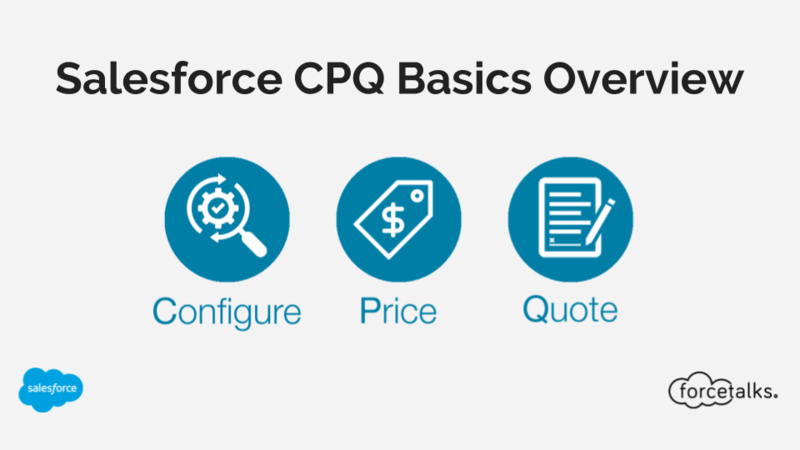 With CPQ, Salesforce.com now offers businesses, especially in the manufacturing, services, and retail spaces, the opportunity to put clear processes in place that can make sales teams more efficient. Accuracy. By putting rules in place, you can head of problems before they start. Sales reps will not be able to order the wrong component, or configure elements that might not be compatible in the same casing, just to name two. Alternately, if a particular component requires a certain service, or vice versa, that can be required. Efficiency. Having a consistent sales process reduces training time and costs. Add in the ability to deliver customized quotes that can be integrated with digital signature systems, and you have a tool set ready to streamline your sales process. Excited? Great! The next step is to determine how CPQ can benefit your business and examine the cost and effort associated with bringing the system onboard your existing implementation. Copperhill Consulting is ready to assist, with salesforce.com trained CPQ architects and connections to the CPQ team at SDFC. Contact us or your account manager for additional info.